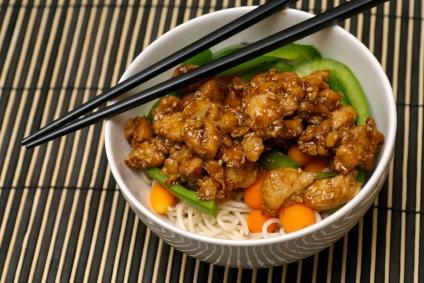 Sesame chicken recipe is a savory dish, especially when served with a side of hot rice or over a bowl of Asian noodles. Sesame chicken is a popular Chinese restaurant meal. The key to a great sesame chicken recipe is the tangy sweet sauce. You can make the sauce sweeter or more tart, depending on your preferences. For sweeter, add more sugar. To make the dish more tart and spicy, increase the amounts of chili paste and vinegar. 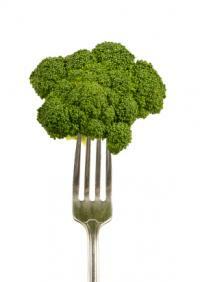 Steamed broccoli with sesame chicken makes a nutritious meal. Mix the marinade ingredients and marinate the chicken for an hour. Next, make the sauce by mixing together all of the sauce ingredients. Pour the sauce into a small pot and bring to a boil, stirring constantly. Turn the heat down to low and keep warm while you are deep-frying the chicken. Heat the peanut oil in a large saucepan. Add the marinated chicken pieces a few at a time. Use tongs to turn them. Repeat with the remainder of the chicken until each piece has been fried. When the last pieces of chicken are frying, bring the sauce back up to a boil. Place the chicken on a large platter and pour the sauce over all of it. Make sure that you serve the sesame chicken recipe hot. The dish is particularly good with steamed broccoli. As the name indicates, this chicken is baked in the oven. It is ideal for those who do not like standing over hot oil to prepare a meal. Put chicken pieces, skin side down, into a shallow broiler pan. Combine sesame seeds, vegetable oil, sesame oil, chopped onion, soy sauce, ginger, cardamom, and minced garlic in a separate bowl. Brush some of the sesame seed mixture on the chicken. Bake chicken at 350 degrees for 30 minutes, basting frequently with sesame seed mixture. Turn and continue to bake and baste for another 30 minutes. Put under broiler to brown, turning once. Remove chicken pieces from pan. To make the sauce, blend 1 tablespoon of cornstarch with 1 cup of water. Stir cornstarch mixture into pan drippings. Cook in a saucepan, stirring, until sauce is thickened. Pour over chicken and serve hot with rice.